Paul tells Terry that he's back on roster for the airline. Maria tells Richard she'll go to Hong Kong with him, but she wants Danny to come with them. Richard is shocked and not at all pleased. He doesn't think Danny could settle with them in Hong Kong - he suggests he goes to stay with Max instead. Maria says Max won't have him. She admits to Richard that Danny isn't Max's son. Richard says he knows - he's suspected it for a while. But that's in the past, it has no bearing on their future. Maria explains about the split when Shane was a little boy. She never told Max the truth about Danny's paternity until recently. Max couldn't handle it and left her. Maria says her whole life has been a mess. But Danny must never find out the truth. Richard tells Maria that nothing can change the way he feels about her. He'll accept Danny - but will Danny ever accept him? Scott is preparing his camera ready for the wedding. Danny is sulking about Richard again. SCOTT: What's he done this time? DANNY: He breathes. That's for starters. Scott says that Danny is just a whinger - he should talk to Maria and Richard about their relationship. Danny isn't pleased and storms out. Jim and Scott talk about Danny as they set up the furniture for the wedding. Scott says that Max isn't like a real father - he tries, but he always ends up yelling at Danny. Jim tells Scott that Richard is going to Hong Kong, but he still doesn't know that Maria is going to go with him. Scott runs off to tell Danny. Scott comes in through the back door and tells Danny that Richard is going to Hong Kong. Danny is stunned and says that'll be great! When Scott has gone, Maria comes out of her bedroom and says that Scott is right. And also she wants to go with him, and take Danny too. Danny is shocked and very angry. Maria insists she is going, but Danny says she doesn't even know Richard. Danny insists that he isn't going. He is nearly beside himself with hurt and anger. MARIA: We want you to come with us, as a family. DANNY: Some family! You and me and him and six million Chinese! Maria says that Shane is old enough to be on his own, but Danny isn't. Danny says he can take care of himself. Maria asks him to think about it carefully. DANNY: I can look after myself. You do whatever you want. Julie is badgering Jim about looking at the wedding invitation returns. He starts to open them. Julie says there might be a late acceptance - from Aunty Gwen. Jim is shocked to hear that Julie has stuck her nose in and says that Julie had better hope that Aunty Gwen doesn't accept. He tells her not to tell Helen on any account. Just then there's a knock at the door. It's a present for Paul and Terry. Helen comes in and tells Jim that Terry and Paul still haven't found a flat. Helen suggests asking them to stay with them when they get back from honeymoon, just for a few weeks to take the pressure off. Danny tells Scott about the situation with Maria going to Hong Kong with Richard. Danny is very upset and tells Paul that they want him to go too, but he doesn't want to. Scott sympathises. 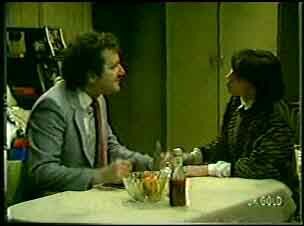 Jim tells Helen he dropped in on Max and he was dressed up to go and see Maria. They talk at cross-purposes for a while. Jim thinks Max has mellowed recently, but Helen says it's more that he's been forced to grow up. Jim says that Max is a proud man but deserves a second chance. Finally, it dawns on Helen what is happening - Max thinks he and Maria are going to get back together. Helen is comforting Maria. 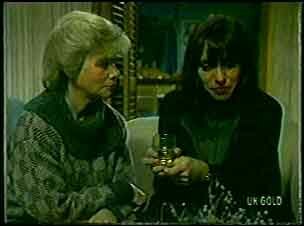 They both cry and Helen tells Maria she'll miss her dreadfully. Helen says that Maria will have to have the courage to tell Max and Shane that she's going to Hong Kong. She advises Maria to keep calm and not to let Danny drag her into a slanging match. Maria is just off to see Max. She tells Danny that she has a chance of being very, very happy with Richard - something she hasn't had with Max for a long time. Danny is standing in her way. She really wants Danny to come - there's loads of opportunities in Hong Kong. Danny doesn't buy this - Maria just wants to go with Richard. Shane comes out and overhears the tail end of their conversation. Danny tells him that Maria is going to Hong Kong to live with Richard. Shane digests this, and then says that if it's what Maria wants, she should do it. Danny is even more angry and says he doesn't want to go - all his friends are in Erinsborough, and what's left of his family. He storms off to see Max. Shane tells Maria that he can't talk now - Des is expecting him. Maria says she's going to see Max anyway. SHANE: You haven't told him, have you. It's going to hit him hard. Terry and Shane are laughing at an article in a magazine. Des has made them cucumber sandwiches and tea - apparently it's a "kitchen tea". Des and Shane have got Terry some presents - mostly kitchen utensils! 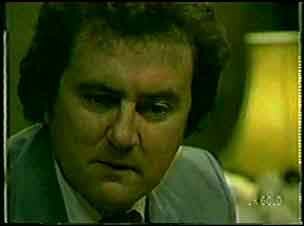 Shane asks Terry if she'll have dinner with him tonight - there's been a bit of hassle at home and he needs to get out. She agrees. Max is wearing a suit when Maria arrives. He starts to make his reconciliation speech to her, but Maria tells him that she's going to Hong Kong with Richard. Max looks gutted.